and unsanitary place with no food, water, or proper medical care. Those in areas of high flooding fled to their rooftops, begging rescue helicopters to airlift them to safety. Many died trapped in their attics or waiting to be rescued. Meanwhile hundreds of police were dispached to protect property from looters. Hurricane Katrina was the most awesome disaster that residents of Louisiana have ever seen. But the deadly results of Katrina were as much a product of human callousness as an act of nature. New Orleans is a city underdeveloped by capitalism. Social services are chronically underfunded, while working people depend on low-wage service jobs and send their kids to dysfunctional public schools. Despite its once massive port, seventy-mile petro-chemical corridor, and historical significance, the city has, like third-world Caribbean islands, depended on scraps of the tourism industry for its sustenance. At least half the city, including its Central Business District and much of its housing stock, is at or below sea level. Under normal conditions, massive drainage pumps constantly drain rainwater from the city. But even when the pumps are working as they should, poor areas of the city routinely face minor flooding. 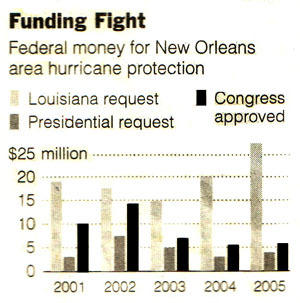 So it is no surprise that Louisiana hurricane preparedness was woefully underfunded by President George W. Bush and Congress. Bush and Congress ignored those who explained the urgent need to invest in critical infrastructure that could prevent New Orleans from becoming inundated with flood waters, while diverting tax dollars to the Iraq War. In a 2003 interview of Bill Moyers’ NOW, scientist Daniel Zwerdling noted the cutting of Hurricane funding to pay for the war in Iraq. According to columnist Sidney Blumenthal, “FEMA warned that a hurricane striking New Orleans was one of the three most likely disasters in the U.S. But the Bush administration cut New Orleans flood control funding by 44 percent to pay for the Iraq war” (“No One Can Say They Didn’t See It Coming,” Spiegel Onlien, 31 August 2005). Congress now authorized $10.5 billion dollars for Gulf Coast aid, a smaller sum than $16 billion that Florida received when hurricanes hit it in 2004. Contrast both sums with the $162 billion that Congress appropriated for the first year of the Iraq war. The Iraq War has also diminished manpower for disaster relief. At the time of the hurricane, almost half of the Louisiana National Guard was deployed outside the state. Some, like the 3,000 members of the 256th Infantry Brigade, were in Iraq — reportedly with critical high-water equipment. In an unscripted NBC benefit concert, rapper Kanye West spoke the truth: “George Bush doesn’t care about black people,” and America was set up “to help the poor, the black people, the less well-off as slow as possible.” The poverty and blackness of those bearing the brunt of the hurricane is obvious to anyone watching CNN. The plight of these victims underscores the existing race and class inequalities in New Orleans. The hurricane hit at the end of the month, the time when poor people are most vulnerable. Food stamps don’t buy enough but for about three weeks of the month, and by the end of the month everyone runs out. Now they have no way to get their food stamps or any money, so they just have to take what they can to survive. The poorest people were without transportation, food, or resources, but no hurricane preparedness plan — and none of the doomsday exercises of federal, state, and local agencies — made any provisions for their evacuation. Disaster planning officials knew that 112,000 people in New Orleans were without any private form of transportation. In 2003, the Times Picayune produced a five-part series that predicted that they would likely face death in the event of a Category 5 hurricane. The total absence of policies to carry out an evacuation of the poorest ensured that they would be stuck in the city with no way out. Race and class divided even the sick. Tenet paid private contractors to evacuate its hospitals, and so did HCA to evacuate Tulane Hospital that it runs — well before Charity Hospital, the region’s trauma hospital whose patients are poor and overwhelmingly black, received any help. Katrina was not the first hurricane, nor the first major flooding disaster, to hit Louisiana. During Hurricane Betsy, Lower Ninth Ward, an area almost entirely under the poverty line and 99% black, was intentionally flooded to “save” the wealthy white uptown neighborhoods. Both FEMA chief Michael Brown and the dominant media claim that the high death toll is “going to be attributable a lot to people who did not heed the advance warnings.” Brown’s comments suggest that hundreds of thousands foolishly “chose” not to evacuate, even though the reality is that tens of thousands of New Orleanians did not have the means to comply with an evacuation order. Mayor Ray Nagin blasted the slow response of federal agencies: “They’re not here. It’s too doggone late. Now get off your asses and do something, and let’s fix the biggest goddamn crisis in the history of this country.” The response was indeed too little, too late. A malignant mixture of disinterest and incompetence was clearly on display. On NPR’s All Things Considered (1 September 2005), Homeland Security Czar Michael Chertoff cavalierly dismissed an NPR field reporter’s claim that 2,000 or more were at Convention Center without food or water and in unsanitary conditions. Subsequent reports verify that 15,000-20,000 were at the Convention Center, languishing in deplorable conditions complete with dead bodies. The Convention Center was on dry ground and would have been accessible by military transport ground vehicles or helicopters, so there is no excuse for delay. On the evening of September 2, even FOX News reporters, frustrated, called attention to the policies that continued to trap refugees at the convention center. It is said that supplies were held up because helicopters could not land or because of a report of hostile gunfire. If the United States is capable of sending planes that can withstand enemy fire to drop bombs in Iraq, however, certainly they are capable of air-dropping supplies into a US city. Looking at this disaster, one cannot ignore the ecological destruction that amplified it. New Orleans, like many major cities, was built in a place that posed danger, and environmental problems of global warming and coastal erosion have exacerbated the precariousness of the city. Marshes and wetlands help to mitigate a hurricane’s effect as it approaches the city. But erosion has diminished the size and ability of the coastal marsh and swamp to absorb the hurricane’s force. Coastal erosion has two important causes. Once rich river silt that built the delta is now being directed to deep waters off the continental shelf to allow for easy river navigation. Salt water intrudes from canals built for oil and natural gas drilling and pipeline needs. The Bush administration fiddled while New Orleans flooded. The administration and Congress failed to provide basic preventative infrastructure and neglected to prepare a rescue plan, choosing instead tax cuts for the rich and war spending in Iraq. This is the latest in a long line of Bush failures, and a growing number of Americans are beginning to see it as a “war at home” on poor and Black people. Many hurricane refugees rightly feel abandoned. But the ruling class abandoned New Orleans long before Katrina hit. Racism, environmental disregard, and capitalist deference to “the market” for social planning have long been the hallmarks of New Orleans. Eventually, public money will begin to trickle into the state. Hotels, casinos, chain stores, and “Disneyfied” developments will compete for the sorely needed money and serve to reinforce a system that was unable to respond to people’s needs before, during, and immediately after the hurricane. But New Orleans can be rebuilt with a different ethos — an ethos of environmentally sustainable planning; a vast transportation infrastructure upgrade, including public evacuation plans; a bolstered public works system that creates stable union jobs; new public schools; a renewed investment in the public healthcare system; and cultivation of neighborhood councils as incubators for a new, participatory, and radical democracy among the working class, poor, and oppressed. What can we do to help advance such an alternative vision? Demand a change in national priorities, focusing on the needs of oppressed working people, beginning with the return of US troops from Iraq and the rebuilding of the infrastructure of New Orleans and the US Gulf South. Robert Caldwell, Jr. is a resident of the Ninth Ward in New Orleans, a member of the Green Party and Solidarity. You can contact him at <jamais.vu@gmail.com>.